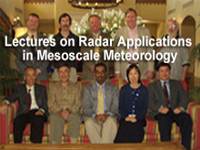 This website provides access to the streaming presentations and PowerPoint source files for the 11 lectures delivered during the AMS Educational Forum “A Primer on Radar Analysis Techniques Used in Mesoscale Meteorology” held on 23 October 2005 in Albuquerque, NM. The presentations discuss how many advanced techniques for the analysis of meteorological radar data can be used to improve understanding of the structure, dynamics, and evolution of mesoscale circulations. The Forum was organized into four sections: 1) Microphysical Characterization of Precipitation Systems Using Dual-Polarization Radar Measurements, 2) Single Doppler Retrieval and Assimilation Techniques for Use in Mesoscale Models, 3) Analysis of Mesoscale Processes Using Wind Profiling Radars and Velocity Azimuth Display and 4) Airborne Doppler Radar Analysis of Tropical and Extratropical Mesoscale Systems. The objective of the Forum was primarily to introduce graduate students to important radar analysis techniques as they are used in atmospheric science research with the goal of improving our understanding of the structure, dynamics, and evolution of mesoscale circulations. A basic, formal understanding of both radar and mesoscale meteorology is necessary to gain the most from the lectures. Each individual presentation is rated as either intermediate or advanced level content. July 2014: Much of the material presented in these lectures is still beneficial to many. The Session 1 lectures on precipitation and dual polarization radar do not have the benefit of many years experience of deployment in the U.S. since that time. The lectures in Session 2 on assimilation of radar data into NWP are now also dated as this field continually evolves.